1 hour, plus chilling times. Makes 6 to 12 tarts, depending on size. 1. In a saucepan, combine the water and sugar over medium heat and cook, stirring occasionally, until the sugar dissolves, 3 to 5 minutes. Remove from heat and cool the syrup. 2. In a large bowl, whisk the eggs into the sugar syrup. Stir in the evaporated milk, vanilla and a pinch of salt. Strain the mixture through a fine-mesh strainer into a container with a pouring lip. This makes a generous 2 cups filling, which will keep up to 3 days. Cover and refrigerate for several hours before using to allow any air incorporated from whisking to dissipate before baking. 1. In a large bowl, use a pastry knife or fork to mash the butter with ¾ cup of the flour, just enough until it will clump together (there will still be bits of butter showing), to form an “oil dough.” Flatten the dough out into a square and refrigerate until well-chilled, at least 20 minutes. 2. Meanwhile, in a separate bowl, mix the egg and water into the remaining ¾ cup flour to form a “water dough.” If the dough is too soft, work in extra flour, a tablespoon at a time. Knead the dough until it is soft but still tacky, then form into a square about the same size as the oil dough. Cover and refrigerate until well-chilled, at least 20 minutes. 3. Flour a work surface and remove the water dough from the refrigerator. Roll the dough out to a rectangle twice the size of the oil dough. 4. Take the oil dough out of the refrigerator and spread it out on top of the water dough, leaving a large enough border of the water dough to be able to fold over the oil dough entirely. Fold the sides of the water dough over the oil dough. If the dough begins to warm and soften at any time while folding, refrigerate or freeze it until it is firm and chilled again before proceeding. 5. Roll the entire dough out to a large rectangle about the size of a sheet of paper (8 ½ by 11 inches), and mark it into thirds. Fold each outer third over the center third, as if folding a letter, and roll the dough out into a large rectangle again. If the oil dough pops through at any time, “patch” the hole with flour to seal. Repeat three more times, chilling the dough as needed to keep it very cold. 6. On a lightly floured work surface, roll the dough out to a 1/4-inch thickness. Cut out disks using a round cutter that are slightly larger than the diameter of your tart molds (for example, cut 4-inch rounds if using 3-inch tart shells measured at the base, with 1/2-inch sides). 7. Lightly grease the inside of your fluted tart molds and gently press the pastry disks into the molds. Chill at least 20 minutes before baking. Meanwhile, heat the oven to 350 degrees. 8. 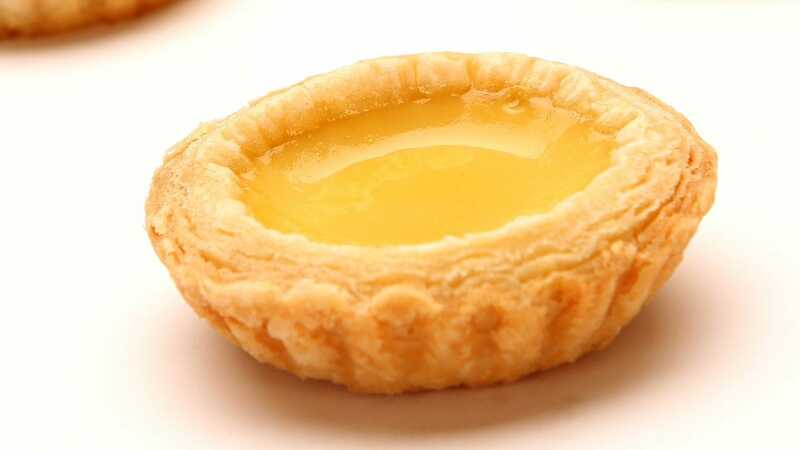 Fill each prepared tart shell three-fourths of the way up with egg custard. 10. Position the tarts evenly on a baking sheet and place in the oven. Bake until the crust is puffed and lightly colored, and the filling is set (it should barely jiggle when tapped), 30 to 45 minutes. Baking times will vary depending on the size and depth of the tarts. Remove from the oven and set aside to cool for 5 to 10 minutes, then carefully tap the molds to remove the tarts. Note: Adapted from a recipe in “All About Eggs” by Rachel Khong and the editors of Lucky Peach.